A rural Canadian community still struggling with the terrible grief of losing 15 of its own found some solace on Sunday in the one place that has always been the town’s beating heart – its hometown hockey rink. The population of Humboldt, Saskatchewan – usually just 6,000 strong – swelled as mourners gathered for an evening of prayer and hymns in memory of the young Humboldt Broncos ice hockey players and team support staff killed when their bus collided with a semi-trailer on Friday. It was an overflow crowd at the vigil, with family of the Broncos players joined by Canada’s ice hockey community and dignitaries, including Prime Minister Justin Trudeau. 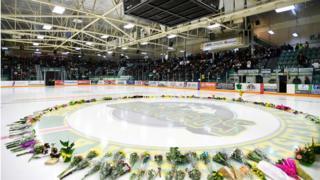 Mourners, many in green-and-yellow Broncos jerseys, spilled out of the Elgar Petersen Arena into viewing areas at the curling rink and high school. There was a minute of silence at 19:00 local time when the team would have taken the ice. Team chaplain Sean Brandow recalled arriving at the scene of the fatal crash shortly after the collision. “I walked up to a scene I never want to see again, to sounds I never want to hear again,” the pastor said through tears. Faith and scripture, he said, have helped him through the last 48 hours. “You know how Jesus was who he said he was? His scars,” the burly chaplain said. In Humboldt, the team is a revered institution that has brought home two national championships in the last 15 years. “To keep a junior team in a small little city like Humboldt – it takes all the community to be involved, it takes all the businesses to be involved. These are the heartbeats of these little towns and cities,” former National Hockey League (NHL) player Sheldon Kennedy told the BBC. Before joining the major leagues, Mr Kennedy played junior hockey in Saskatchewan. Like the Broncos players who were on their way to a play-off game against the rival Nipawin Hawks – and like so many other junior teams playing “Canada’s game” – he spent long hours travelling the desolate winter highways in the province. In 1986 a bus carrying his team, the Swift Current Broncos, hit a patch of black ice on a Saskatchewan stretch of the Trans-Canada Highway, killing four players. Over 30 years later, Western Hockey League team uniforms are still adorned with a clover patch in remembrance of the young men killed that day. Mr Kennedy and three other former NHL players who were on that bus in 1986 attended Sunday’s vigil. “What I learned through all of this is what you say and what you do doesn’t have to be perfect,” he said. Broncos president Kevin Garinger said the team has been overwhelmed by the support pouring in worldwide. “We feel your love,” he said. Online fundraisers raised well over C$4m ($3.1m; £2.2m) in just a weekend from donations from all over the world. The team will bring in outside help to manage the money and ensure the families of the victims are provided for, he said. Humboldt, about 200 km (125 miles) north of the provincial capital, was a home away from home for many of the young athletes involved in the crash. Many Broncos players came from outside of Humboldt, from cities across western Canada – one of the reasons the tragedy resonated far beyond the small prairie town. Many junior hockey teams rely on host families, who open their homes to out-of-town players. The bonds create lasting ties between players and families spanning across Canada’s vast prairies. Team captain Logan Schatz, 20, played for the Broncos for more than four years. His host family recalled how the young athlete was quick to make himself at home. “The first night he was here, he walked in and he was checking the fridge to see what we had for leftovers,” Colin Brochu told the Globe and Mail. Humboldt’s Rene Cannon and her family hosted three of the players, now deceased, in their home: Xavier Labelle, 18, Adam Herold, 16, and Logan Hunter, 18. Ms Cannon told the Canadian public broadcaster that the family is readying itself for how quiet their house will now be. “We aren’t built to not get attached. We take every single boy that’s ever come into our house right into our hearts and into our family,” she said. The lorry and bus collided on Highway 35, north of Tisdale. The team had been heading to the town of Nipawin for a play-off game. Aerial photographs of the crash site show it happened close to a junction between two roads. The lorry driver was not injured and has been allowed to go free while authorities investigate, the Royal Canadian Mounted Police said. There were 29 people on the team’s bus when the crash happened around 17:00 local time (23:00 GMT) on Friday. That number includes players, coaching staff and the driver. Fifteen were confirmed dead by officials on Sunday. Fourteen people were also injured in the crash. Head coach Darcy Haugan, 42, was among the first confirmed casualties. Mr Garinger said that Haugan believed that “the Humboldt Broncos were about not building hockey players but creating amazing young men”.